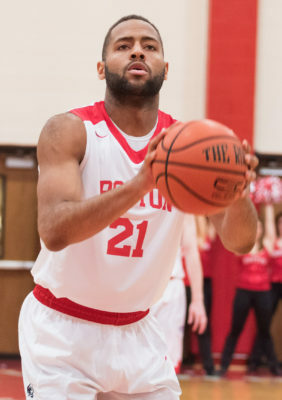 The Boston University men’s basketball team failed at the opportunity to pull into a tie for first place in the Patriot League, falling to Bucknell University 91-79 Sunday afternoon at Case Gym. Coming off a tight 75-72 road win against Lafayette College, the Terriers (11-10, 7-3 Patriot League) looked to disrupt Bucknell’s (15-8, 9-1 Patriot League) seven game win streak. In the matchup, BU was missing its leading scorer senior guard Cedric Hankerson due to injury for the second straight game. The Terriers’ head coach Joe Jones realized playing without Hankerson was tough, but knew he was not the reason the team lost. From the onset, BU used to its signature “trapping” defense. While this strategy forced some unwanted three point attempts from Bucknell, it was not enough to restrain the Bison’s 6-foot-10 senior center Nana Foulland in the paint. He tallied six points and three rebounds in the first five minutes of the game. In response, the Terriers sped up the tempo, successfully neutralizing Bucknell’s interior game with several points in the paint of their own. But it didn’t last long. Midway through the first half, the Terriers surrendered their double teaming tactic to try to contain scoring in the paint. However, Bucknell quickly exploited this change with several three-point field goals. Additionally, BU’s offensive efficiency suffered as it closed the half with a meager 38.7 percent shooting from the field. This, among a confluence of other factors, contributed to its 12-point deficit at the half. Going into the second half, the Bison displayed no signs of relenting, and quickly expanded their lead to 18. However, what did the Terriers in was their poor transition defense. After every bucket BU made or missed, Bucknell almost instantaneously moved the ball quickly up the court. The poor transition defense led to several quick scoring opportunities for Bucknell, ultimately eroding the Terriers’ morale. Jones said he realized this, and took the blame for his defensive scheme. The pioneer of such alacrity on the fast break was Bucknell senior guard Stephen Brown. His impact in the game was unparalleled, as he scored an impressive 21 points, five assists and four steals. Ultimately, though, the difference maker appeared to be discipline. The Bison maintained their poise throughout, unfazed by the frequent changes in momentum. Contrarily, the Terriers were skittish and easily frustrated by Bucknell’s quickness and fluidity, Jones noted. Yet, Jones though much of the team’s difficulties were attributed to a lack of energy, or lack of “fight.” This apparent sluggishness was a sign that BU was unable to challenge a team like Bucknell. Despite the tough loss, Jones remained hopeful. His optimism after tough losses has led to ensuing wins that turn into winning streaks. He said he’s anxious to see how his players fight back in the following Patriot League games.